The Ochils, Campsie Fells and Lomond Hills are the areas of high ground between Edinburgh, Glasgow and Perth. This guidebook describes 33 mostly circular day walks, covering a variety of terrain such as moorland, forestry and rocky crags. The routes range from easily managed walks to long distance with difficult terrain. Year round. May, June and September are recommended. Tops of the Ochils are particularly hard and cold in winter. 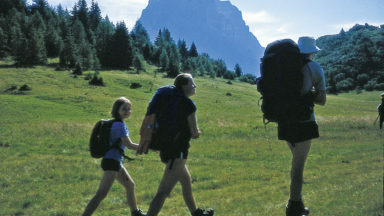 Circular hillwalking routes of varied difficulty from just under 4km to 25.5km. Basic navigation required. The Ochils, Campsie and Lomond Hills form a prominent band of high ground across the central belt of Scotland, providing a dramatic backdrop to the nearby cities of Glasgow, Edinburgh and Perth. Overlooked by many walkers on their way to larger hills in the north, these three ranges provide uniquely wild, challenging and beautiful walks literally on the doorstep of many towns and cities. Ironically, it is perhaps their proximity to these major areas of population which means that these hills remain a relatively uncrowded oasis for walkers. 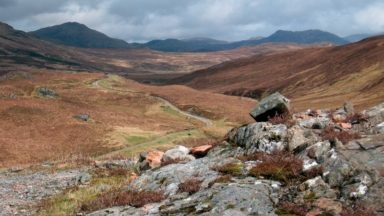 Collectively the three ranges combine a rich mixture of distinct neighbouring habitats, ranging from: moorland, ancient and managed forestry, deep lochs and reservoirs, fast-flowing burns and meandering rivers, to rocky crags and fertile carseland. This Ochils, Campsie Fells and Lomond Hills guidebook offers a mixture of routes, including many popular peaks such as Ben Cleuch, Meikle Bin and West Lomond, as well as areas that are well off the beaten track. 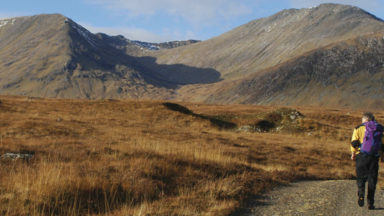 The walks have been chosen to reflect the diverse landscape that exists in these ranges, and affords as much importance to smaller peaks and lower-level walks as it does to larger hills and high traverses. 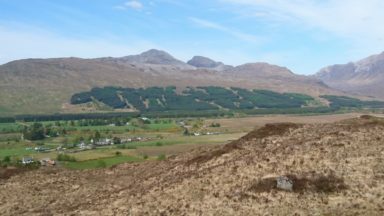 Several of the walks include peaks known as ‘Donalds’ – hills in lowland Scotland over 2000ft that have a drop of 100ft on all sides. 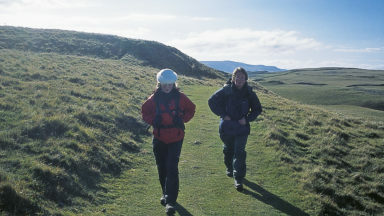 While some of the walks are justifiably popular and lined with obvious tracks and paths, walkers are also encouraged to explore routes following the natural lines of ridges and glens where few or no paths exist, so that the guide not only gives details for enjoying some classic routes, but also acts as a starting point for linking and creating endless combinations of different routes. The majority of walks included are circular, and wherever possible, start from a suitable place to park a car. The walks are divided into three sections, one for each range of hills, and each section opens with an introduction to the area. All the route descriptions begin with a summary of information, along with an overview of what can be expected on the walk, including any significant details about terrain and navigation. 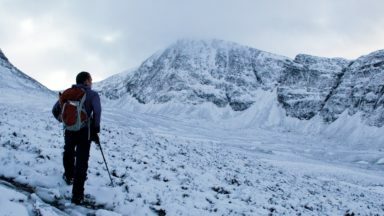 Despite being relatively low compared to the larger ranges in the Scottish Highlands, the hills covered in this guide present challenges that require similar levels of skills and experience to those that would be needed in more mountainous regions. A basic level of ability in macronavigating is assumed; as is the understanding of grid references, map orientation, gradients, map symbols and estimation of distances. For more challenging routes the ability to use a compass in setting and walking on bearings is crucial, as are micronavigational skills involved in timing and pacing distances. Please note that the times in this book are pure times and do not account for rest breaks or difficulty in the terrain. Many people may find that the walks take longer than the times given. I have just recently purchased this book and done lots of walks from it and it really opened up my local hills to me. Previously there were many hills in the Campsies and the Ochils that I wanted to climb but couldn’t figure out a safe route to them from the OS maps but this outstanding book gives you detailed route information all following easy to identify features on the ground to use as navigational handrails, it is well written and uses extracts from the relevant OS maps to illustrate the routes. There are many little known and little walked but spectacular hills featured here that you wont find in any other guidebook. At last an excellent guide book for the Campsies/Ochils and Lomonds. Congratulations to the author. 'It's clear the author knows his subject well and has tramped the hills described in this book very many times. His acquaintance, wisdom and knowledge of the three areas stand out proud. 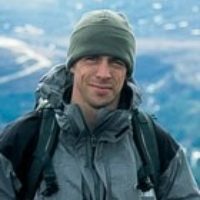 As a keen outdoor enthusiast, Patrick Baker spends the majority of his free time walking, climbing or scrambling in the Scottish hills. This passion for the outdoors has led to several expeditions in major mountain ranges across Europe but closer to home, time spent in the mountains of the West Highlands and the Cairngorms and the hills of the Central Scotland is an ongoing source of interest and enjoyment.